If you are a serious golfer and want to improve your putting game, golf swing and other skills, a putting green is the answer. These putting greens are also called golf mats. We chose 12 of the most popular indoor putting greens on the market and considered factors such as size, materials used for construction, design, sand traps and hazards included, customer comments and reviews and other factors as well. The three putting greens reviewed below topped the list over the others in all categories. Any one of these putting greens can be used indoors and will help you improve your game. Manufacturers have improved the quality of the putting greens so many have very natural-seeming grass which makes the practice more effective, depending on what skills you are working on. There are many different types and styles of putting greens for indoor use on the market. They come in all sizes and designs. When you are looking for the right putting green for your needs, there are several things you want to look at and consider. Taking time to research the different choices and ensure that you understand what makes one better than the other will help you make a great decision on the putting green to use indoors, for your practice needs. Golfers will be able to practice their putting stroke with this 9’ x 3’ putting green that is in the shape of a kidney from Putt-A-Bout Grassroots. It provides 3 different cups to aim at. The putting surface is high quality and designed to stay smooth. The built in sand traps will help catch missed shots you make. The materials of this putting green are made from a blend of 50% poly and 20% foam. It is the perfect gift for the person in your life that plays golf or wants to learn. It provides the opportunity to practice their putts in their office, den, family room or anywhere they can set up the green. It is a great way to work on your skills without having to go to a commercial putting green and spending extra money. Accelerator Pro provides golfers with the ability to practice the key putts you need to practice on a true roll surface. There are alignment guides to follow at 3, 5 and 7 feet and assist you with the entire putting motion which include squaring the face, your back swing and the follow through. This helps you learn the skills needed for the best accuracy and distance on every putt you make. The automatic ball return feature helps you get more practice in without having to stop and go get the ball from the hole. This helps the user to maintain a steady stroke along with consistent tempo for each putt made. These features mean more effective and efficient practice. This product has been designed to resemble actual putting conditions by adding a gentle upslope at the cut so you can practice the follow through. The true roll surface has been designed to have a stimp reading which that matches the ones you find on actual putting greens on the golf course. It will usually take 24 hours for the green to flatten out. Take it out of the box when you get it and lay it flat and then give it time to flatten the way it is supposed to. This makes a terrific gift for the golf enthusiast in your life. Sinking the putt takes practice and that is what this Par 1 putting green provides. It has an inclined green with 2 hazards and a 4” cup. It measures a nice sized 12’ x 6’ which gives you plenty of room to get really good practice in without dominating the room. This product has a nonskid, cushioned back that helps it stay in place so your putts aren’t messed up by shifting greens. The slight incline features a cup with 2 small hazards on either side of the cup so you have some challenges to face when putting. These small hazards will help you sharpen your putting aim. The smaller-than-regulation cup helps you develop better accuracy. 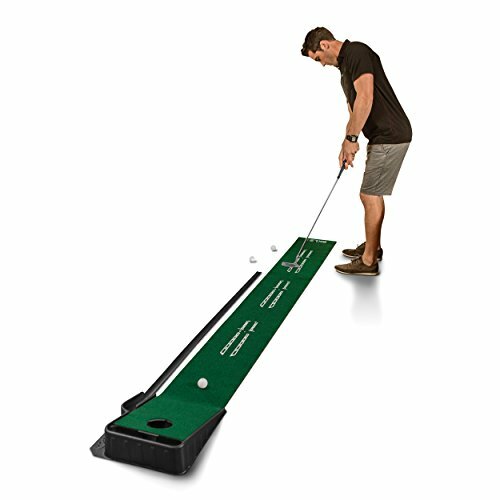 This is a great putting green for the den or garage or office to help you work on your game. It rolls back up so it can be stored in its own box. If you’re looking for a good, but simple way to really sharpen your accuracy and other aspects of your game, this is a great putting green to consider. Golf enthusiasts are very serious about their games so having the opportunity to practice and enhance those skills is usually pretty important to them. An indoor putting green provides the opportunity to work on your putting skills indoors in your own home. There are many different styles of indoor putting greens available. The three choices we have reviewed above are all excellent quality putting greens that will help you improve your putting game by improving accuracy, aim, and follow through. They include inclines, hazards and other factors that force the user to practice certain aspects of their putting game. To learn more about indoor putting greens and how to choose the right one for your needs, read the buyer’s guide below. It has all the information you will need to make the right decision for the indoor putting green for your preferences. 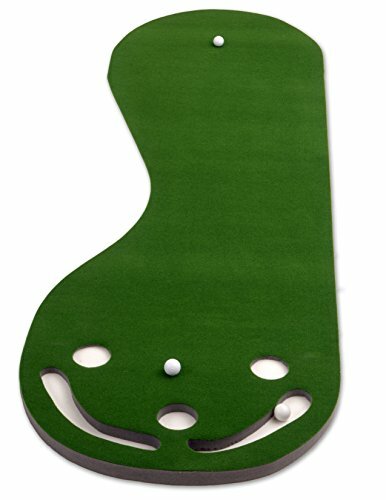 There are two kinds of golfers that purchase this type of putting green; the ones that want to work on their game and improve their skills and the ones that are just looking for a relaxing distraction in the office. It is a great means of stress relief if you are in a high-powered corporate job. There are many different features that putting greens have that you will want to size up while you are sorting through all the choices to see which one suits your style the best. The purpose of a putting green that you can use inside is to either, practice and improve your game or to relieve stress and relax during your work day. Whether you choose a 3 foot mini green or 15 foot whopper, you want to choose the right putting green for your needs. Below we have listed several things that you will want to consider about the putting green that you purchase. These things will help you choose one that will fit inside your home where you want to keep it and provide the practice that you want to improve your game. Cost and Your Budget – Putting greens that are designed for indoor use are available in a range of prices from very inexpensive to several thousand dollars for a high end custom made green. In many cases the price point will reflect the quality of the putting green. With a little bit of research, you will be able to find a good quality green without breaking the bank. If you have a specific budget in mind that you want to stay under, be sure to set that budget amount before you start looking. With all of the choices available, you will be able to find the right putting green for your needs. Size – There are many different sized putting greens available from a very small one that is only a few feet long to extra long ones that can run as long as 12-15 feet. You want to find a putting green that will fit comfortably in the space you will be keeping it. You don’t want the green to take up the entire room, so look at the space that you want to put your putting green and purchase accordingly. Storage – Unless you plan on having the putting green set up at all times, you want to find one that is stored easily. Many models can be disassembled or rolled up and stored away with no problem at all. If space is a premium, look for a model that can be easily rolled and put in the original box or some other storage space. Surface – Look for a putting green that has as realistic a surface as possible. The more the surface resembles real turf, the better your practices will be. You can use a level to check that your floor is truly flat or at the very least, so you can identify what the slant is. The speed of the ball will be affected by the firmness of the floor underneath the green. A ball will roll slower on a spongy carpet surface than if the green is on a hard floor. Contour – Many putting greens for indoors have accessories that can be purchased to change the contour of the green. Some have inclines and hazards so changing the contour as well can really provide challenging practice for the golfer. Cleaning – Putting greens that are used indoors are typically easily cleaned by either vacuuming them or wiping them with water and detergent. The manufacturer’s recommendations will tell you what you need to know about keeping the green clean and looking great. If the putting green is kept indoors, it is unlikely that it will require a lot of cleaning. True Roll – A good quality putting green needs to have a smooth, undisturbed surface. This is called a true roll. The artificial green should not have bumps or breaks. The surface also needs to weigh enough to lay flat on the floor and cover up any imperfections. Realistic Bounce – When bouncing the ball on the putting green you want to be certain that it has as close to a realistic bounce as possible. This will allow you to practice legitimate chip shots on your putting green. Durability – When you are purchasing a putting green that is designed for use inside, you want to be sure that it is durable and long lasting. Creases in the middle, rolling and the turf wearing are all problems that can occur in a cheaper green. The higher quality putting greens will not have these problems and should last from 10-15 years. There are many companies that give 10-15 year warranties and depending on the company, could even offer lifetime warranties. With all of the different putting greens on the market, it is easy to forget some things that you want to check. We’ve listed the main points below so you can remember what you need to check at a glance. These factors will help you choose the right indoor putting green that will provide hours of putting practice and last for years. Does the turf look as close to natural as possible? Does it have contour or contour ability, inclines and hazards? The information in this buyer’s guide is designed to provide as much knowledge as possible so you can choose the right putting green for use indoors that fits your space and playing goals. There is a large amount of putting greens on the market and they come in all shapes, styles, designs, and price points. Sorting through them all can be overwhelming if you’re not prepared with the right things to look for. The right information is always helpful when there is a choice to be made. You want to spend your money on the best putting green you can get for your budget. When you take the time to learn the right things to look for and compare, you will be able to enjoy your choice and the improvements it helps you make in your putting game.